I wonder how long the Web 2.0 style will be around. All those shiny graphics are great to look at and create, but it can’t last. In some respects, it’s good to capitalize on the trend, but it the same respect it’s good to explore new techniques and styles. Regardless, there is enough demand with the Web 2.0 style to justify a tutorial on some nifty Web 2.0 Stickers! This tutorial was created in Adobe Illustrator CS3. Most, if not all, functions should be available in Illustrator 10 and up. 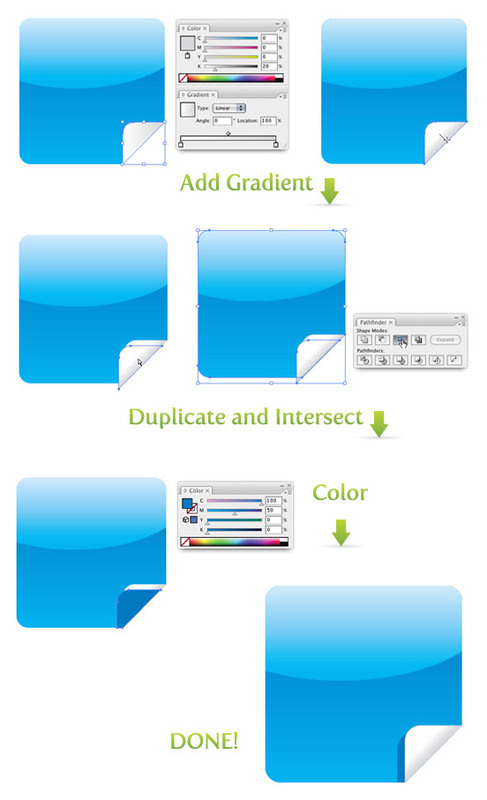 Functions specific to Illustrator CS3 will be noted. 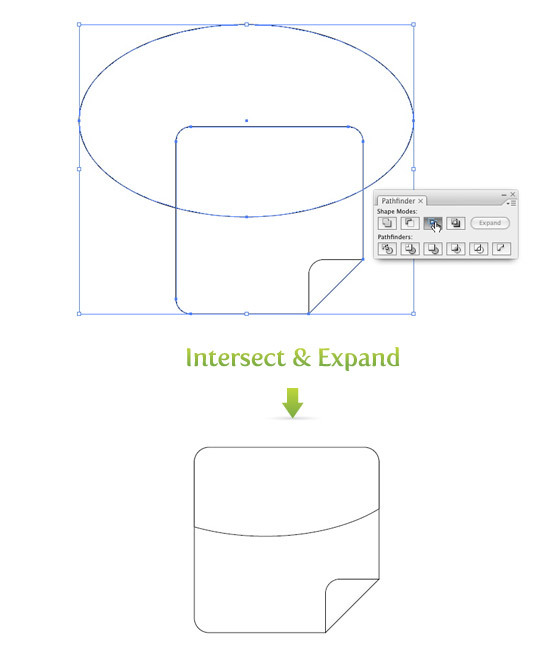 Create a box with rounded corners with the Rounded Rectangle Tool. Next, create another box that is a little smaller. Grab a corner of the second box with the Selection Tool (v), hold Shift, and rotate the box 45 degrees. Place the second box on the bottom right corner of the first box where you would like the fold of the sticker. Copy (⌘c) both boxes and Paste In Front (⌘f). 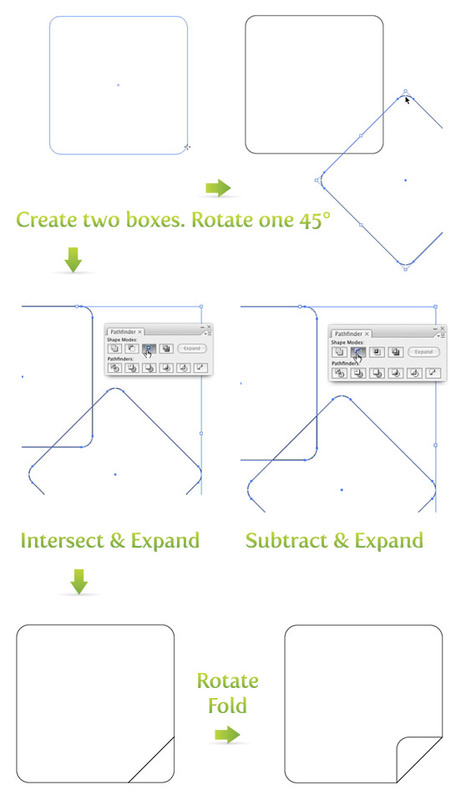 Select one of the original boxes and one of the rotated boxes and Intersect and Expand the shapes, creating the fold. Take the second copy of each box and Subtract and Expand them, creating the sticker. Now, select the fold, grab a corner, hold Shift and rotate 180 degrees. Use the Ellipse Tool (l) and draw a circle half way down the sticker overlapping the left, top, and right corners of the sticker shape generously. Copy (⌘c) the sticker and Paste In Front (⌘f). Take one sticker shape and the circle and Intersect and Expand, creating the shimmer shape. In this step I am briefly going to explain using gradients to create the shiny effect. If you need a more in depth explanation, refer to Step 3 in my previous post Shiny Buttons Without Blends or Transparencies. Use the follow steps for the shiny effect. Select the shimmer shape and create a Linear gradient with the first swatch in the gradient 20% Cyan and second swatch in the gradient 100% cyan. Adjust the gradient with the Gradient Tool (g). Select the sticker shape and create a Linear gradient with the first swatch 100% Cyan and the second swatch 100% Cyan and 50% Magenta. Again, if that was too brief, refer to Step 3 in the Shiny Button post. Now it is time to give the fold some depth. Select the fold shape and create a Linear gradient. Keep white as your first swatch, select 20% black as the second swatch and remove the border. When you adjust this gradient, start in the middle of the fold shape, hold Shift, and drag out to the bottom right of the fold at a 45 degree angle. Now the fold is looking pretty good, but to give it a little more depth we can add a shadow to the fold. Select the fold shape, hold down the Alt/Option button and drag the shape slightly down and to the left. Copy (⌘c) the the sticker shape and Paste In Front (⌘f). Select the newly copied sticker shape and the copied fold shape and Intersect and Expand. Change the color of the fold shadow to 100% Cyan and 50% Magenta. Select the original fold shape and Bring It To The Front (⌘ Shift ]). Now you have a fancy Web 2.0 sticker! These stickers look great with icons or text on them, just experiment! Try adding different colors, shapes, or whatever. 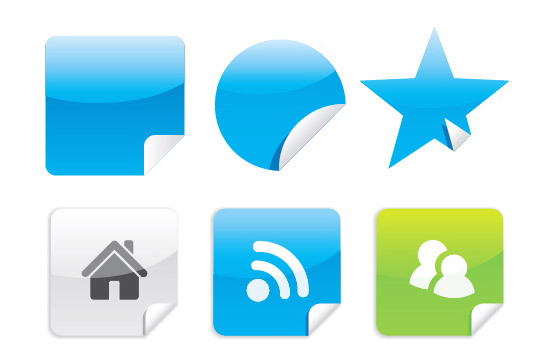 If you are to lazy or need some sticky icons quick, go check out some I created on iStock! We are LogoProDesign as a Custom Logo Designer, We checked your artwork collections. Those are amazed us. ..
İts wery helpful tutorial. Good way to create your own icons. Very Thank you! That was so well written! I’m learning so much from your tutorials! Thank You! while I still don\’t think \”Web 2.0\” means anything I still appreciate image tutorials like this. Those are amazed us. Thanks for that type of good work collections. Thanks for that type of good work collections. work collections. We regularly checked your website for good artwork example. evaluate Amtrak’s plans to termanate this long neglected route, and expand the high speed designation pass Mobile to Jacksonville. Thank you! That was so well written! And nicely illustrated. They look awesome, thank you. Nice tutorials! But how do you the icon one? I mean the color effect…its like transparent or something. I wanted to do that one. It’s simply beautiful. I love it. Superb!! Thanks for this nice tutorial dude, love it awesome. And now I know!.. Thanks for this nice tutorial dude, love it awesome. And now I know. I am a total newbie to illustrator and when i first created the sticker, i was like f*****k ! Currently i am following this tutorial, this site is helpful for vector artist, taking idea and exploring creativity thanks to the team of this site. very cool, and not all that difficult. I just started a course in graphic design and I always enjoy good tutorials on creating graphics in illustrator. Thanks. thank u very much very nice tut. wow!..thank you..great work and thanks for the tips. Keep them coming. nice and easy Workshop. Thanks! Thanks, it is very good, I like it very much. I hope that more revenue sharing, super nice. This is a very intuitive and helpful tut. Great work!! thats was so kewllllllllllll… thanks for sharing it. I found the web 2.0 stickers tutorial really useful, easy to understand and insightful. I’m still learning alot about illustrator and I have to say this is the ONLY time I’ve ever used the Pathfinder Palette! If I had to suggest anything, it would be maybe have a quick video tutorial also? Keep em’ coming! Over all, as I said a very nice tutorial! Thank you very much. A very useful and well written tutorial. Very nice tutorial. The other tutorials i have seen for this effect have been difficult to read and understand. Yours however is readable and followable. Great tutorial, ill be using this! Those are pretty sweet to the beat. Keep up the coolness. Wow man, I totally love your work! Wow, thats a really sleek way to do things. Very web 2.0.. love it! Great howto! Very good work. Keep it going. Thanks! Thank a lot, very helpfull and well explained, easy to do even when you’re not an expert ! I would like to create a sticker with a background image covering the background like a texture but an image I already have and then apply a shimmer and it still look good. So far it’s a bit hit and miss! The image is already vector so I guess it shouldn’t be too tricky but I’m stalling! I usually do this a couple of ways. One way, is to make the shimmer shape a transparent white, instead of a gradient. Another way (I do this for stock illustration) is make a separate shimmer shape for the texture. Fab!! Got it working nicely now, just a matter of getting used to it! thanks again! select 20% black as the second swatch and remove the border. 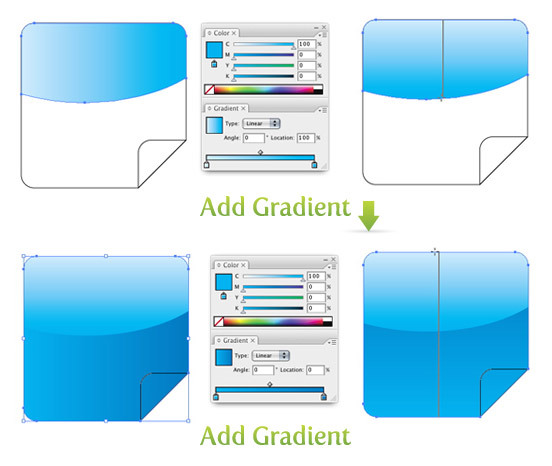 When you adjust this gradient, start in the middle of the fold shape, hold Shift, and drag out to the bottom right of the fold at a 45 degree angle. I am a beginner with Illustrator and I want to tell you that these tutorials are helping me alot. The explanation is very clear and good enough for a beginner like me. Keep up the good work mate! I am the same and feel the same like you. sweet tutorial, and the results speak for themselves.